“there is a fundamental split” – very incisive. I thought about analyzing mean wait times, as you did, but also probability of getting a seat (hard to do without boarding data), and combining the two into some measure of service. Are there many people like me who will wait for the next vehicle (especially if it will be soon) to improve chances of getting a seat? Another problem is passenger behaviour. My pet peeve are the passenger who MUST egress through the same door they entered, no matter what. Happens mostly with the front doors of buses and the CLRVs. The center or rear doors can be used, but they refuse. As usual I am in awe of your analytical efforts (and over the holidays too!) and agree completely that the current way the TTC measures ‘on time’ gives a very false view of what an actual passenger (or wannabe passenger) experiences. Not to add to the complexity of devising a meaningful metric I would note that if one is on an ‘early’ vehicle that sits around to get back on time it is also an annoyance. Maybe one is more comfortable sitting down (or at least ‘inside” but you are still not getting closer to your destination! In any case Happy New Year! Steve: And a Happy New Year to you too! All of this data gathering will accomplish nothing. The TTC is not interested. If they spent as much time finding ways to actually do something as they spend on giving reasons why it won’t work, there might actually be an improvement. On street supervision is lacking and therein lies the problem. They don’t know/care what is actually happening on the street. Typical problem: 2 or 3 buses going through an intersection on one light. Riders waiting across the street to transfer/board are left to wait, and wait and wait some more. 1 bus is late, 1 on time and 1 ahead of time. Possible solution: Run a trial in off rush hours that only 1 bus uses the light at a time. If there is a bus bay there will be no problem for other traffic. Re-evaluate situation after 30/60/90 days. Expand/decrease on a case by case basis. Try SOMETHING! You know the old saying about doing the same thing over and over yet expecting different results. That is the TTC. Never mind thinking outside the box, I say GET RID OF THE BOX! Exiting front doors. This has become a worse problem than ever before and there are multiple reasons for this. Speed. It is not safe to try walking backwards. Operators too lazy to pull bus in to the curb at the rear doors. Lowering step. Only works at front. Many people NEED this. Many don’t. Solution: Open ALL doors manually at all stops whether or not anyone is at the door. NOTE: Only do this with a few waiting riders not if a large crowd since this will lead to fare evasion. This MAY encourage a few people to try the rear door exit just for the sheer novelty of it! Someday I would like to ask a psychologist (or even a psych major), why someone riding behind the rear doors walks past the door, gets off at the front, and then WALKS BACK PAST THE REAR DOOR! Idiot! You probably mentioned this aspect somewhere in your analysis; but, just in case, there is a circumstance that allows one to outrun TTC schedules. I caught a streetcar on the King route at Dundas West. The driver was only 2 minutes ahead of his nearest King rival. The passengers received the famous TTC fast checkout, and we took off down Roncesvalles, which was almost empty, at a medium pace. The driver did nothing dangerous, made all the requested stops, and stayed well within the speed limit, but I’d bet he made up a good 5 minutes by the time we got to Queen. I have attended many public information sessions with City Planning and the TTC in Scarborough (SSE). The TTC personnel are often asked why the 116 and 86 buses always end up bunched together with large gaps between the bunches. I have been to so many sessions, I know the TTC answer by heart. They will say the bunching is caused by traffic conditions. They are sometimes asked why the buses cannot not be better co-ordinated. GO bus drivers radio each other to improve spacing between buses. The TTC response (not official because I may not reflect their actual policy) is that they prefer to have drivers concentrate on driving. They feel additional activity would be too distracting. I have personalty seen 6 116 and 86 buses following each other, several times in 2016 on Eglinton. I always wonder what kind of gap they are creating and why nothing is done about it. My personal beef is that the 86 and 116 routes are way too long and a Lawrence East subway station would go a long way to shorten those routes. The City Planning insistence that a Lawrence GO station is the answer is totally absurd. The SmartTrack service is headways of 8.3 minutes versus 4 for subway. City Planning has no idea about TTC service and really doesn’t work closely with the TTC on these matters. I have a few comments. I’ll make them in order of (in my view) declining importance due to TL;DR syndrome. Top, I think the best, and ultimately easiest way, to calculate and show the impact of wait times is to use Monte Carlo simulation. There are two simulated variables: the time of arrival of the passengers at the stops, and the time of arrival of the vehicle. The arrival of passengers is not, in the real world, going to be strictly linear. There will also sometimes be groups of two or three passengers showing up the same time. On the vehicle arrivals, well there is lots of actual data from the various route analyses. On the theoretical side, the vehicle arrives exactly every N minutes as per scheduled headway. Then, there are various effects that can be simulated. Easiest is to just put a variance on the probability of arrival based on what’s seen in the actual route data. Likely some variation of a bell curve. Then you could add a probability for the vehicle wanting to run in a bunch, or for the vehicle to get short turned and not show up at all, or a major traffic accident, or…. This sounds complicated, but it really shouldn’t be. What you are really generating is a probability curve of a passenger or a vehicle to show up over time, then asking the computer to step through short intervals of time and seeing if the passenger or vehicle actually shows up. The computer would keep track of the waiting time that each passenger experiences. This could be grouped or graphed in buckets as desired. What the MC simulation can show is unexpected effects that you would never see in the simple analytical method. You can also simulate a lot of passengers (like on the King route), and be able to say that, if the simulation is reasonably accurate, every day N passengers will wait more than T minutes (choose the numbers from the simulation results for maximum impact). Last week, I was waiting for a Queen car downtown. An overloaded CLRV came along, with another CLRV following shortly. “They haven’t short-turned cars recently” I thought and waited for the second car. Sure enough, we were short-turned at Roncesvalles. As for leaving by the door you entered by, in the era of all-door loading that makes sense to me. Making everyone exit by the rear doors means it’s harder to get on at the rear. Or maybe we should go back to the PAYP method of the Peter Witt cars! 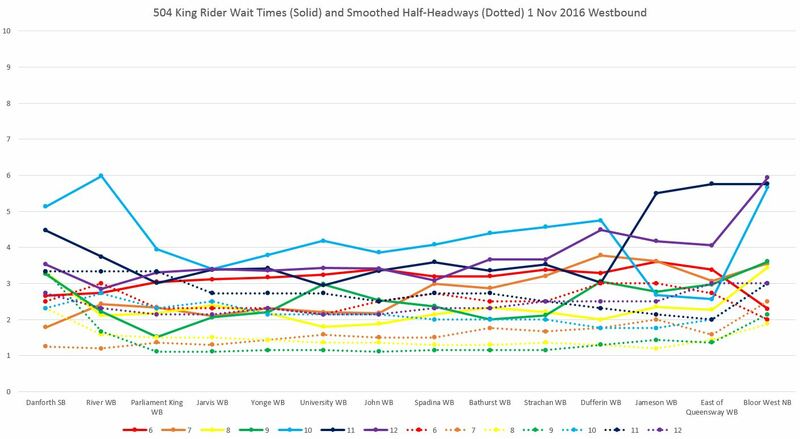 The analysis of wait-times and headways is interesting, but it should not distract from the reality of driving buses and streetcars. The question is constantly asked “Why does not the TTC take action to fix the headways?” I think the answer is that very little can actually be done, given that there are no magic wands. One idea is to have GPS track every vehicle, and have “bus traffic controllers” radio instructions to each driver to speed up or slow down. Looking at the number of vehicles in service at any given time, this game would be very complex. The controllers would need to be aware of road conditions and traffic congestion before they give directions, and the driver needs to focus on the road and the passengers, rather than having conversations with head office. If told to “speed up”, does the driver run yellow lights, break the speed limit, or drive by bus stops with passengers waiting? Telling a driver to “slow down” is easier, but the passengers on a bus get irate when their ride stops for no apparent reason. You could try to put a device in each vehicle that is red, yellow or green, depending on whether control says you should go faster, slower, or status quo. The unpredictability of each route is caused by 3 variables: 1) traffic flow, 2) traffic lights, and 3) number of passengers at each stop. Try timing a route with light traffic, few passenger stops, and good luck with traffic lights. Then time the route with heavy traffic, passengers at each stop, and hitting every red light. You will have a deviance in time based on these circumstances. These deviances can not be controlled, and they are the cause of bunching. Effectively the drivers need to take steps based on their experience, and have to balance safety, treating passengers nicely, keeping their schedule, and surviving the ride each day. Having a traffic controller act as a back-seat driver may not really help much. Steve: This sounds all very well, but also very much like the TTC’s shoulder-shrugging “we can’t do anything” attitude. They adopted a new measure of “on time” attempting to have vehicles leave the termini on time, and therefore presumably properly spaced. However, they gave so much latitude in the measurement, that vehicles can be bunched right from the beginning of a trip and be “on time”. There is the basic question of spacing service, something the TTC’s route supervisors (then called “Inspectors”) used to do, but it now happens rarely. Of course there are variations caused by surges in passenger demand and the interaction between transit and traffic signals. The question is what do we do about this problem. Yes, a driver waiting to space out service may annoy riders, but other riders will be annoyed because bunched vehicles make bad use of capacity not to mention increasing wait time for those unlucky enough to be in the gaps. These are more numerous than those who arrive just in time for two or three vehicles to show up together. I don’t expect drivers to run signals, and if we had better transit priority systems that would not be necessary much of the time anyhow. When I started this whole business of route analysis about ten years ago, the TTC was doing nothing with the mountains of data they already had. If nothing else, my work has encouraged them to do some of this themselves, and to have a better sense that this type of analysis is possible to quantify what is happening. Even if some problems are challenging, at least it is possible to point to them, and to measure the benefit of any changes. This article on wait times was published as a work in progress. I know that we will never get headways exactly matching the schedule. That does not happen even on the subway. The issue is to determine how much of an effect these irregularities have in the real world and to understand why riders don’t always believe the TTC’s claims about service quality. The problem with that is drivers are people and like all people they have different ideas of what they should do which is usually what suits them, not what is best for the riders a.k.a paying customers. There STILL needs to be “On-the-street” supervision. People sitting in a control room are not the complete answer. I recall a conversation between several operators about different route desk supervisors. Naming one guy as laid back, take it as it comes etc. only gets involved if really necessary. Another who does NOTHING until everything collapses and then he gets involved. Yet another who was such a PIA constantly micromanaging that many operators complained bitterly about his messing in things. So, management reassigned this PIA to another desk! End of problem. Except likely another bunch of operators had to put up with him!! Early last year there was a big problem with the St.Clair Car. So bad they put “On Street supervisors” at the Loops and at least one along the route. No car left the terminal until the Supervisor said so, Along the way a Supervisor might get on the car and talk briefly to the operator telling him how to adjust his running. Result? Great big improvement in spacing etc. These supervisors were later removed. Result? SNAFU (Situation Normal All F***ed Up.) Example: Mid-day, mid-week, I went to board an eastbound Car at Keele Street to begin my trip. There were several people waiting and by their disgusted looks they were there for some time. Look west to Gunns Loop. No Car in sight. Wait, wait and wait some more. FINALLY, a car comes west to loop. Another car comes along to loop. A third car comes along to loop. NO car leaves the loop. No more cars can make turn so fourth car sits on St.Clair and nobody can get off as there is no stop. Eventually, ONE car heads east. We all board (a big group by now) and as it starts east more cars follow. Get to Caledonia to transfer to go north to Castlefield, cross street and see car #2 with a handful of riders. No bus. 3rd car comes and fourth car. Total riders: ONE car full. Still no bus. Finally bus arrives (15+ minutes) and 5th car now in sight! Great service. My solution? Eliminate one car and that operator’s job. Give a job to a supervisor. Better “value” for your dollar. IMNHO (In My Never Humble Opinion). Steve: When there were on street supervisors, I could look at the tracking data and see the moment when they left for the day. Service fell apart. Exiting from the front doors no matter what is another one of my pet peeves! If you’re mobility challenged, fine, that’s where the blue seats are, but the number of times I’ve seen streetcar users get up from their seat near or behind the centre/rear doors and while we’re all waiting for them to hop, skip, and jump up to the front to exit is incredible… in front of people who are trying to board of course. It’s almost enough to get one riled up enough to shove one of these people out of the back! On the effects of crowding, I once took Queen on a weekend and of course the vehicle which pulled up was a CLRV. The cause of the slow service and crowding seemed to be evident once on board. Inside the CLRV running on ALRV headway were 4 (YES FOUR) baby strollers in between the mass of humanity. Besides running enough weekend service to handle baby stroller surges (unrealistic) how do we plan our way out of that? Maybe we need baby stroller racks on the new streetcars and buses? Brian Smith said: The unpredictability of each route is caused by 3 variables: 1) traffic flow, 2) traffic lights, and 3) number of passengers at each stop. Steve: if we had better transit priority systems that would not be necessary much of the time anyhow. I repeat long routes (street car or bus) are a major source of the problem. Scarborough has no hubs so the long routes are an invitation for bunching and poor service. Eglinton is a sink for many routes and when Eglinton backs up, many routes are affected. Just wait when Eglinton is reduced to 4 lanes with the LRT. The LRT does not replace the long routes such as the 116 which will still run into Kennedy (the route goes from the Zoo to Kennedy, goes through Guildwood village – very slow and has one of the most number of buses on it). The Lawrence 54 will be diverted to Kennedy, making it longer because of the Lawrence GO stop. A better arterial rapid transit grid (my SmartTrack 2.0) re-enforces the hub and spoke systems with shorter street car and bus routes. There will always be congestion points, but they will affect fewer routes. City planners don’t understand that design is part of the solution. I have not met one city planner that is aware of the impact of their stupid “plans”.. The goal is then to improve the information flow to drivers, based on more detailed and specific movement directions (hold, go, speedup, slowdown, turn)…and find gaps where this isn’t happening (either in time (ie. weekends) or in space (ie, maybe at end of lines))…and define specific points where information could be improved. The other goal is to find places with high information requirements, and simplify or improve the information flow or remove challenges that are requiring a lot of route supervisor time and energy. Steve: At one point there was a scheme to give the operators a display showing how their route was behaving so that they could see how attempts to manage the service would work. This did not proceed due to budgetary limits. I don’t know whether it has been incorporated in the new central management system to be rolled out over the next few years. Leaving aside how central controllers manage various lines, the existing system has major constraints in the amount of data it can display on board due to the archaic technology involved. Based on the plans for other LRT routes, 116 will terminate at the LRT. One of the reasons the TTC has been more successful then most transit systems in the post-war period is its grid system that allows users to get from one place to almost any other in a relatively straight line and only one transfer. I guess things are starting the break down as the city has grown and there is now congestion even in the suburbs. Extending a grid of rapid transit routes into the suburbs is the best solution. So many have commented on people exiting vehicles by the front door. While this makes no sense when another door is closer to where they were seated, my peeve is with people who remain in their seat until the vehicle comes to a stop and the doors have opened. Quite regularly, these people arrive at their chosen exit door just as it has closed and have to add to the delay while the door is re-opened. It is understandable that some do not wish to move about while the vehicle is in motion, and YRT started adding a “please stay seated while the vehicle is moving” to some of their stop announcements about a year ago, but there is no reason for an able-bodied passenger to move to their door of choice while the vehicle is stopped at the stop prior to their stop. There is a special place in hell for people who waste other peoples’ time such as by doing this. Just like those who do not get their money out at a checkout until the cashier has totalled everything up, or those who hold up traffic by waiting for ALL lanes on the road they are entering to be clear. Steve: Many people have difficulty with moving through crowds, maintaining their balance, etc. and wait until the last moment before getting up. Depending on vehicle loads, it is possible to be “trapped” in a seat far from the door by a crowd that boarded long after one took a seat in what was not, at the time, a difficult place from which to reach an exit. Yes there are people who leave anything you care to name to the last second, but they are a minority, and our transit system has far greater problems. To put it another way, they are not an “efficiency” that will add much, if anything, to overall service quality. However, you are free to base an election campaign on them. Be sure to tell people how this will keep their taxes down, and how we don’t need to add any service. doconnor said: Based on the plans for other LRT routes, 116 will terminate at the LRT. The LRT does not solve anything. It is yet another step to get to the hub, Kennedy. You take a bus, wait for a LRT then wait for the subway. With a Lawrence East subway station the bus takes you directly to the subway. The TTC is on record that the 116 goes to Kennedy and the 54 will be diverted to Kennedy. This is different than looking at plans for other LRT routes. Raymond said: Early last year there was a big problem with the St.Clair Car. So bad they put “On Street supervisors” at the Loops and at least one along the route. No car left the terminal until the Supervisor said so, Along the way a Supervisor might get on the car and talk briefly to the operator telling him how to adjust his running. Result? Great big improvement in spacing etc. … My solution? Eliminate one car and that operator’s job. Give a job to a supervisor. Better “value” for your dollar. As a regular 512 rider who is often fuming about the gaps in service, I mostly support this motion. ESPECIALLY when we have a system-wide streetcar shortage. That said, this need not be a zero-sum game: with fewer people walking away from the current stops in frustration, ‘well-spaced service with a few less vehicles’ would still fill to capacity on the peak hours in the central part of the route. We all know the need for more vehicles, but the ongoing willingness to not deal with operations is soul-crushing. They had them “100 years ago” wherein prams (as baby carriages were usually called) were hung on the front of streetcars much like bikes are today on front of buses. Problem is today’s SUV strollers are full of stuff far in excess of what could be carried. A week’s supply of diapers, snacks drinks, wipes, shopping and more shopping! Ought to be a “freight” charge! This would make up for some of the lost revenue the TTC is crying about. BTW I would be curious to know how much lost revenue from Day Passes there is now children ride free. Regarding dependability of headways and wait times, the way to get dependability would be to ensure that all schedules had some “cushion time” built in to each run. You could take a bell curve of run times per route, and select the run time that is achieved on 95% of the runs. Then each run would have some spare time that could be used to cover delays. A dog-walking friend of mine is a retired TTC driver. He told me that bus route schedules that were set 20 years ago have had their trip times unchanged, even though traffic congestion has increased, and true trip times have slowed considerably. I think the unspoken force driving TTC is keeping costs low, since every fare increase provokes public attacks. If this is the case, it would explain why they would minimize the number of busses on each route. If they add a “cushion” to each run, they would need to increase the number of buses in operation, which would add to the costs. If you do not have time cushions built into the routes, then any delay creates bunching, and there is no good way to solve the problem. I suspect that is why TTC reports are not helpful. They do not want to admit that cost control trumps customer satisfaction, and they do not want to pick fights with City Hall, when every mayor (Tory, Ford. Lastman, etc) promises to cut taxes. Steve: Actually, many routes have had padding added to their schedules to the extent that unless something is going unusually wrong, vehicles have to dawdle to avoid getting early. This has a side effect that operators can take long breaks at terminals sure that they will be able to make up time enroute. Leaving anywhere near the scheduled time is not necessary. This type of behaviour shows up regularly in every route’s data that I have analyzed. I imagine the TTC doesn’t want to hire more supervisors because they don’t want to pay the overhead and pensions, (pension is French for gravy). It is suprising, however, that nobody has floated the idea of signals at loops and, on private ROW, at certain stops. Someone suggested gates in a comment a while back about lousy service on Kingston Road. Maybe a simple signal would do. A signal wouldn’t be able to ride with the driver and coach them but it might be able to regulate departure times and dispel the notion that unduly long layovers can be “made up for” as Steve notes. The signals could run 24hrs a day and would certainly help blue night service. The lack of pension can also be sold as an efficiency to the simple-minded and I’m sure there is a willing private sector partner willing to gouge us and bungle it. All kidding aside, I think the signals might be a good compromise. Although I worry about the eventual fate of supervisors if a greater “efficiency” was found in replacing all of them with signals. Actually, this already exists. In Zurich, Switzerland, every vehicle has a large display on the driver’s panel (clearly in view, and placed appropriately to the side so that the driver can see it and react to it but not be distracted from driving) which tells the driver how many minutes/seconds he is behind or ahead schedule (if he is spot on schedule, the display reads zero). The numbers are big enough to catch the driver’s attention (the passengers can see it if they are at the front). The display is updated continually as the vehicle moves and the driver can slow down/speed up accordingly. I really doubt there is a “central control room” where someone manually updates that display, rather, I believe it’s a combination of GPS in every vehicle, maybe some traffic cameras, and a computer which is comparing the current/projected speed of the vehicle with the schedule. Did I mention there is no such thing as “frequent service” over there as per TTC practice, there is a schedule timed to the minute for every single line and every single stop which is followed throughout the day? And that, in my experience, vehicles were on-time (i.e. within ~30 secs of the posted arrival time on the schedule) something like 90% of the time? (except Sundays, when they had a tendency to come as much as 2 minutes early, which was the only complaint I really had) There does seem to be one drawback, which is that minimum headways were never less than 6 minutes (in some cases 5), even during rush hour (although on the heaviest use corridors, where 2 or more lines overlap, the headways were effectively half or a third of that if more than one line takes you where you need to go). And yes, they operate in mixed traffic a lot of the time, and yes, the traffic is pretty terrible during rush hour. My impression is that the TTC is just stubborn about doing things it’s own way, and when experiences of other places are offered as an example, they are more likely to come up with excuses as to why I could never work here instead of, you know, learning from them. Andre S. wrote: Actually, this already exists. In Zurich, Switzerland, every vehicle has a large display on the driver’s panel (clearly in view, and placed appropriately to the side so that the driver can see it and react to it but not be distracted from driving) which tells the driver how many minutes/seconds he is behind or ahead schedule (if he is spot on schedule, the display reads zero). You don’t have to go as far as Zurich to see this. YRT has this display on operators’ terminals. Steve: TTC vehicles also have a display, but it shows their position relative to the schedule, not to nearby service. Being on time is not the same thing as being well spaced. Also, for years after these units were installed, operators ignored them because they were frequently wrong. You sure got that right! If the TTC spent half as much time trying something as they doing finding excuses why it won’t work, they and all of us, would be better off. I can relate multiple suggestions I put forth only to have them shot down for BS “reasons”. One they later instituted many months later, likely after an accident I predicted would happen! Looks like city council is determined to keep transit planning political & unprofessional. Steve: The silver lining on that cloud is that the vote was only 23-19. Southern Etobicoke is waking up to the low priority given to waterfront projects thanks to billions going elsewhere. Happy New Year! And thank you Steve for all your work over the past year. In my opinion, a useful metric is the worst 5% of trips. Why? Because employers have a peculiar habit of insisting that their employees arrive on time. If we assume that a typical full-time employee works 20 days per month, then that bottom 5% means being late to work and in trouble with my boss once per month. People going to work have to leave early to plan for that bottom 5% to make sure they are not late to work. What counts is not average trip time or average wait time. What counts is that worst 5%. Steve: I would argue that the situation is more complex because you assume that only that worst 5% will make you late. If the service is routinely screwed up, then it will be bad enough to disrupt your travel more often than once a month. I note, by the way, that you don’t seem to care about problems on the homebound trip where, at worst, your cat will complain that it has not been fed on time. The problem compounds every time you transfer between routes because each new boarding brings its own set of scrambled headways, and you have little control over how close your arrival time at a transfer point will be to a connecting vehicle. Looking at this the other way around, the reliability of each link in a trip must be very high so that the combined effect of multiple trip segments stays within a target such as 5%. Bill R said “Brian Smith said: The unpredictability of each route is caused by 3 variables: 1) traffic flow, 2) traffic lights, and 3) number of passengers at each stop. While long routes may be an issue a really good transit priority system would permit the lights to be either extended or shortened. That would mean either helping the bus to go faster, or slow it down. If this was done properly the bus going into a gap would be sped up, the bus in front and behind slowed to help even the gap. This would then reduce the issue. This would also help on longer routes – as they also would presumably have more lights to have a cumulative impact on the gap. The issue is that a really good transit priority system would need to know the location of the buses, the gap between, and which routes they were running. A driver would also likely get the idea to drive a couple of km/h below the speed limit if every light he approached turned red, and speed up a little, if they were all or mostly green, or turning shortly after he arrived. I think Steve has a real point, that if there was real control at dispatch ie supposed to be a 5 minute gap, they need to leave the terminal that way, and a real transit priority system with vehicle tracking and real smarts the issue would be hugely reduced. I cannot help but think a lot of the issue starts with being a minute or 2 late at dispatch also means you will be slower all the way through the route because of heavier loading, and a minute or 2 early the inverse (ie start late and get quickly later, early and get earlier). Loadings that are not randomly dispersed should also follow a predictable pattern (ie end of school, end of business day etc) and thus should be allowed for in dispatch. Malcolm N said a really good transit priority system would permit the lights to be either extended or shortened. It seems to me that motorists has more political clout than public transit passengers. Maximum traffic flow is more important that optimized transit vehicle flow. Traffic flow always has a build up of congestion points and fine tuning bus spacing is not the answer. Toronto needs the commitment to public transit meaning a better arterial rapid transit grid that re-enforces the hub and spoke systems with shorter street car and bus routes. It separates public transit from the motorists. The smart transit priority however, can help buses move through existing roadways, and especially where they have their own lanes (and lrts). Smarter drivers should support this, and only require a little education, because a good rides for people who are bound to areas where transit can reasonably support their commute thereby getting more people into transit and out of cars means an easier drive for people who cannot go where they need via transit. We need to implement a much smarter signal system in order to make any in road right of way work to its ultimate capacity, and this will need to take into account vehicle location, gap vs desired gap etc. It is unlikely we will be building rights of way, into all the roads that could use them, so well, we should be looking at what can be done to assist transit on those routes regardless. This is one of those things where the political log jam needs to be broken, and it cannot be a question of doing transit priority and dispatch control instead of rapid transit, but along with it. There is not a single solution to all the issues in Toronto transit. There are many bus and streetcar routes that are not about to become an LRT or BRT let alone subway anytime soon. To the extent that these bus routes can be redesigned to use rapid transit once it is there great, but that rapid transit in the case of LRT will still need transit priority signalling. Shortening green light times will not happen unless there is a long time for which the “don’t walk” light is displayed as you cannot cut down on the amount of time given to pedestrians to cross the intersection. They currently get 1 second to move 1 m after the flashing hand starts but that is going to 1 s for 0.8 m as the population ages and slows down. This will cause problems on streets with short cycle times such as found in the downtown. In the 905 and outer 416 where cycle times are longer it will not be a problem. It is hard to speed a bus up going into a gap because it will probably have a larger than normal number of passengers to pick up and drop off. This may come as a shock, to some, but part of the irregular headway, is simple due to some ignorant & mean-spirited operators ‘playing games’ it is done on a lot of routes, some operators are simply lazy, some are senior operators wanting to ‘break’ the junior operators, by sitting on their rear bumper, not ‘leapfrogging’ & helping them out when they get heavy loads. It’s a frequent occurrence on routes like the 29, 102, 165, 6, 84, 85, 86, 54, 45, 34, as well as others. The other main reason for this headway problem happening is abysmal line management by CIS. I have heard all these reasons and many more from many of my operator friends. Steve: I will be publishing an article soon about the severe problem with irregular headways on 514 Cherry. “Shortening green light times will not happen unless there is a long time for which the “don’t walk” light is displayed as you cannot cut down on the amount of time given to pedestrians to cross the intersection. They currently get 1 second to move 1 m after the flashing hand starts but that is going to 1 s for 0.8 m as the population ages and slows down. This will cause problems on streets with short cycle times such as found in the downtown. In the 905 and outer 416 where cycle times are longer it will not be a problem. I think the impact is just as important in the outer areas. The ability to smooth the routes in the outer 416 is important as part of looking at how to fix service. Also Robert, there is the fact that you can slow the vehicle in front as well. However, it all needs to start with improved dispatch. Yes a heavier loaded bus will be slower, but the idea is to reduce the accumulation over the route, and to start very early. You may not be able to make up for leaving minutes late, but you can help at the margin. and if you do not let it leave late, and help it at every turn (including slowing slightly the bus in front) you can limit the accumulation that will make it worse, by increasing the load at every turn. Again, it is not the solution, but marginal help. Downtown, there are issues certainly with the walk cycles, and to some degree, the vehicle in gap solution has to start with dispatch, and be helped along the way, as much by slowing closing vehicles from behind and opening vehicles in front. It would not require much, if it were started with really disciplined dispatch. Solve the issue, no, help at the margin yes.